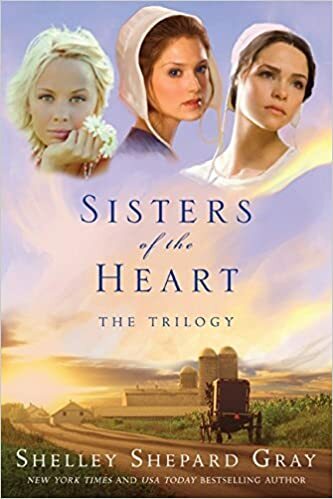 Sisters of the Heart are three heart felt books in one volume written by Shelley Shepard Grey. The books flowed and connected to each other so well. All three have such endearing stories that involved finding love when all seems lost, learning to care, and finding strength in God's promises. Don't get me wrong it's not all romance, there is a great deal of suspense that makes it through all three books. The scenery and the settings were so perfectly described I found myself dreaming of being in the family and working at the inn. I would even settle for just being a visitor and enjoying the experience! Jonathan is my favorite character out of all three books. His character reacted just like we might when something scares us to the core. Makes me thing how I would react if someone intended to do me or my family harm. I would hope that I would try to forgive and go on. I love that these books were together in one volume. Even though the first one could have stood alone I would have wondered what happened to the next sister. It was so fun to just continue reading and finding the answers right away. I bought this book used from a friend. So glad I did! I'm sending it on to my sister.